There are dozens of organised tours which go to the small hinterland town of Daintree, then cross the Daintree River and continue through the southern tip of the Daintree Rainforest before arriving at Cape Tribulation. If sitting in a bus with a group of like-minded people is your preference, every accommodation place in Cairns will have the brochures you’ll need. A different, and to this writer more pleasant, option is to hire a car and drive north. Hire rates around Cairns are ridiculously cheap – the last time I was there I signed up a vehicle for $30 a day. This offers the convenient option of stopping in Port Douglas, a bustling town always busy with tourists and tourism providers. The idea that Port Douglas is very upmarket – popularised when Christopher Skase built his Mirage Resort down the coast from the town – is misleading. There are plenty of affordable options for dining and accommodation. Port Douglas was established in 1877 when Christie Palmerston cut a road through the rainforest and down the mountain range. Palmerston’s track was known affectionately as “The Bump” and went from the goldfields on the Hodgkinson River to Island Point (the first name for Port Douglas) on the coast. Within weeks of its establishment the town was booming. There were an estimated 50 tent pubs, a bakery, a general store and rough accommodation. The recent tourism boom has replicated this rapid growth, with coffee lounges replacing the old tent pubs. Worse luck. Further up the coast is the sugar town of Mossman. When the cane is being cut and processed, seemingly endless narrow-gauge trains run across the town’s main street and along to the Mossman Central Mill. The main attraction in the area – and it is worth the effort – is the Mossman Gorge, part of the Daintree River National Park. The National Park officers have built a series of walkways through the rainforest which allow visitors an excellent opportunity to inspect the local fauna and flora. Beyond Mossman the Daintree Road divides, with the left-hand turn heading towards the small town of Daintree and the right-hand turn leading to the Cape Tribulation/Ferry Crossing. Once across the river, it’s another 31 clicks to Cape Tribulation, which was first sighted and named by Captain James Cook. It was off this coast that the Endeavour ran onto the reef. It managed to limp to the Endeavour River near Cooktown, where for some months it was laid up for repairs. Today the area is part of the 16,965 hectare Cape Tribulation National Park. It is a place of breathtaking beauty, with rugged mountain ranges rising sharply behind the narrow coastal strip, dense rainforest tumbling down the mountains to the beaches, and a bewildering variety of flora. The rainforest boasts species of fern that have been on earth for 100 million years. Both the beautiful flowering Idiospermum australiense and the Angiopteris, the world’s largest fern, are plants of great antiquity. At Cape Tribulation the National Parks and Wildlife have made life easy for visitors by providing a cement path and boardwalk through the rainforest to the headland, where a lookout point affords excellent views across the bay. There are plenty of rainforest trails, with many of the local operators offering walking tours. This is a really worthwhile experience of a tropical rainforest, and you’re never far from civilisation and creature comforts. On the return journey, it’s best to head towards the township of Daintree, which comprises little more than a general store, the Bushman’s Lodge with its huge fibreglass “Big Barramundi”, the timber museum, a couple of restaurants, a school and an assortment of river and rainforest tour operators. 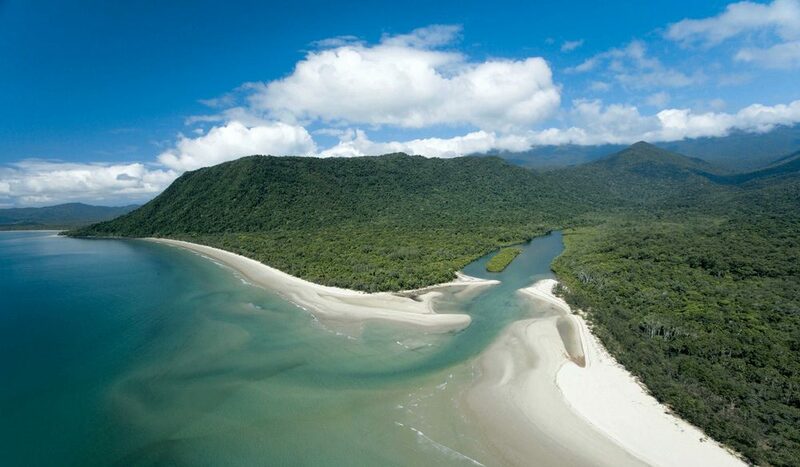 Daintree has managed to establish a tourist industry which has not overwhelmed or vulgarised it. There’s a variety of cruises down the Daintree which allow visitors an opportunity to see crocodiles as well as have a close inspection of the mangroves and the rainforest edging the river. Of these, the most popular is the M.V. Spirit of Daintree, a strange vessel which looks something like a train.